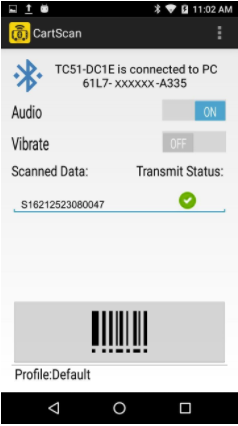 CartScan uses Bluetooth to turn a supported Zebra mobile device into a wireless barcode scanner, sending collected data as keystrokes to a nearby computer running a line-of-business application. 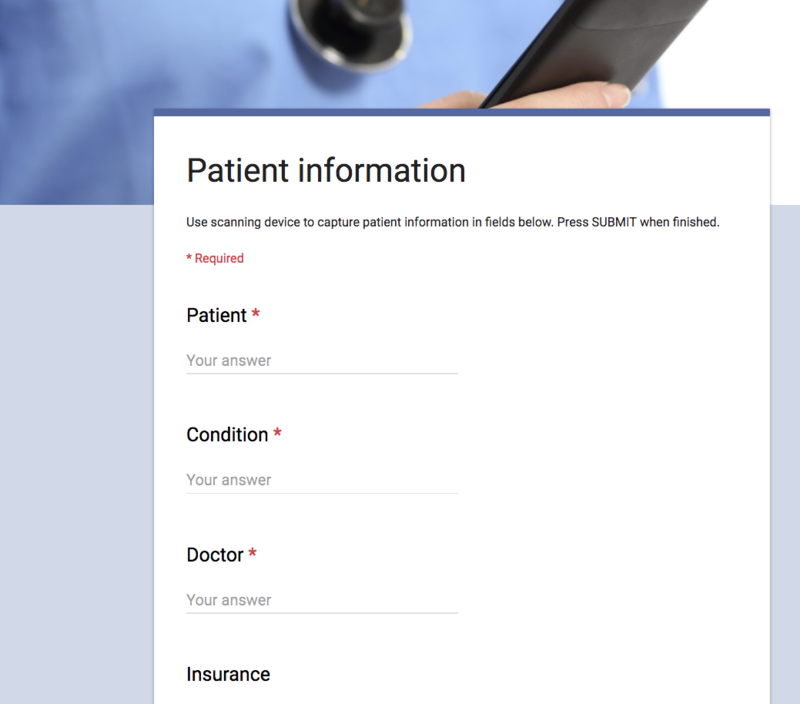 CartScan was initially developed for health care workers, but has applications in warehouse, transportation, logistics and numerous other industries. NOTE: If the mobile device was not previously paired with the PC, see the Setup guide. On the target PC, launch CartScanPCWedge. On the mobile device, launch the CartScan app. Using the mobile device, scan the barcode displayed on the CartScanPCWedge screen. Once scanned, the mobile device attempts to establish the connection to the PC. On the target PC, launch the "line-of-business" app intended to receive the scanned data. Confirm successful transmission of scanned data to the PC by looking for a green check mark under "Transmit Status" as seen above. Repeat Steps 4 and 5 until all data is acquired. See Notes. 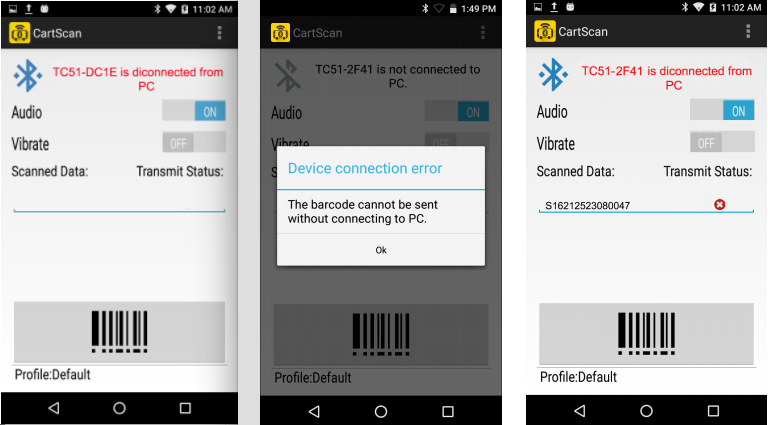 Close the CartScan app on the mobile device when scanning is complete. 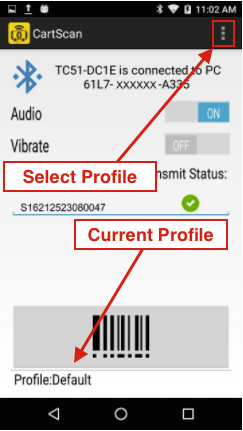 When a barcode is successfully decoded by the mobile device, the scanner beeps and/or vibrates (if enabled). A beep does not reflect successful transmission of the scanned data to the PC. Always confirm that scanned data is delivered properly to the target application. A red "X" appears under "Transmit Status" if a barcode is scanned without an active connection to the PC (below, right). Close the CartScan application on the mobile device when workflow scanning is complete. When CartScanPCWedge launches, the UI screen displays the Bluetooth connection barcode, the status of the connection and instructions to pair and connect a mobile device with the PC. When minimized, the CartScanPCWedge app continues to run in the background, and quits only after "Exit CartScan" is selected from its system tray icon. 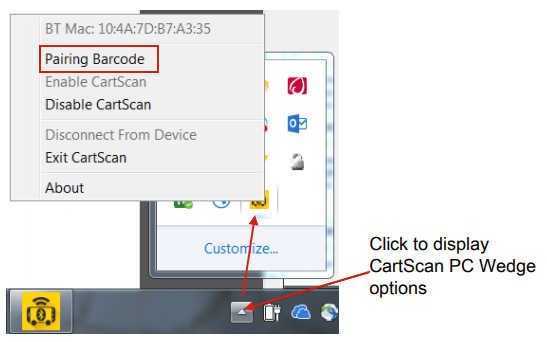 To restore the UI or change its settings, click the CartScan icon from the system tray. BT Mac: Displays the Bluetooth MAC address of the PC. Pairing Barcode - displays the barcode and instructions for connecting (or reconnecting) the PC with a device. 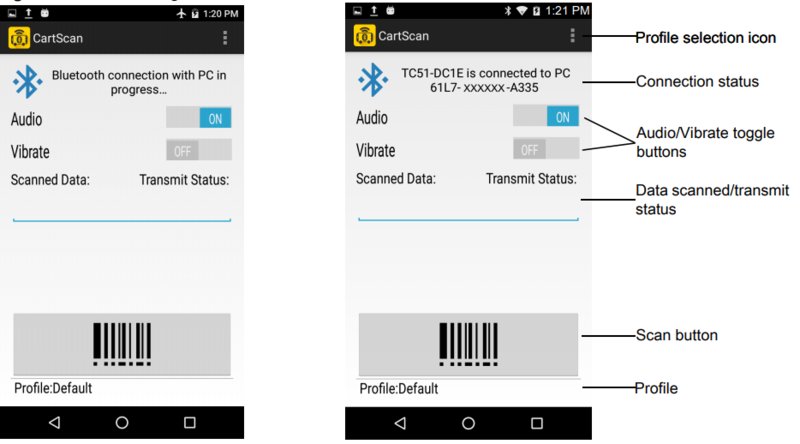 Enable CartScan - activates the CartScan service, which monitors the Bluetooth connection for incoming scanner data. Disable CartScan - Stops the CartScan service and disconnects the PC from the currently connected mobile device. When disabled, the CartScan icon turns red. Disconnect From Device - severs the connection between the PC and the currently connected device. Use this feature to take one device out of service and connect with another. Exit CartScan - Quits CartScanPCWedge, stops the CartScan service and disconnects the PC from the currently connected mobile device. Select this option when scanning is no longer required on the PC. To re-launch, double-click the CartScanPCWedge icon (or CartScanPCwedge.exe) from the desktop or Start menu. About - Displays CartScanPCWedge version information. On the PC, click the CartScanPCWedge icon in the system tray. If CartScanPCWedge is not already running, launch it from the desktop or Start menu. Select "Pairing Barcode" to display the barcode and pairing instructions. Follow the instructions in the "Pairing Barcode" window. Users of Zebra CartScan and CartScanPCWedge applications should have proper training, reference materials and usage guidelines to understand how CartScan works and how to use it. Below is a list of suggested end user best practices. Always check the status of the connection before scanning (look for "...connected to PC..." message on the device). Keep the device within 25 feet of the target PC to maintain the connection. Always confirm that data was transmitted after scanning (look for the green checkmark in CartScan UI). Always confirm correct placement of scanned data into desired fields on the target PC. Do not allow other users to interact with the PC or scanning device while workflow scanning is in progress.